Prior to Christmas the following petition asked people to make a pledge to pause on Christmas day and give a thought to children who will be homeless. While this is a nice gesture, I think more needs to be done than simply thinking about this outrageous situation which has no place in any civilised ethically progressive country. I doubt if Cameron or his cohorts who have done much to make people homeless gave these children even a passing thought as they gorged themselves on fine food and expensive drink and other luxuries in their centrally heated homes with many spare rooms. What a wonderful man if only our prime minister and MPs where so noble, so thoughtful, so ethical, so decent and compassionate. Sadly greed rules their lives and they care nothing for the people whose lives their polices have destroyed . Did you know that in this so called developed country Thousands of families had to rely on emergency food handouts this Christmas. The debacle in the house of commons recently was a disgrace, when Duncan Smith sneaked out after smirking through Ester Mcveys speech during the Labour Party’s Opposition Day debate to discuss the dramatic rise of food bank use and the increase in hunger in the UK. All but these greedy callous self-serving MPs . An eleven percent rise is hardly suffering is it. View McVey’s speech during the food bank debate labelled by Labour’s Sir Gerald Kaufman as the nastiest he had heard in his 43 years as an MP . This Christmas, around 60,000 people in Britain faced going hungry and will continue to go hungry in the New year and every following year with more and more people suffering poverty and destitution in the sixth richest country. Given many good hardworking people in this country are impoverished and struggling, given your decimation of the benefits system and the NHS, given your failure to control fuel profiteering, given your blatant criminal behaviour re expenses and your attempts to control a free press for your own benefits – my polite response to your plan to give 11% pay rises to yourselves is: it is immoral and disgusting. I very much doubt that Cameron will gave a thought on Christmas day for the lives of those he has destroyed for the suffering and misery deprivation. Why not write to Cameron let him know what you think about this injustice. Perhaps you could suggest he follows the example of the president of Uruguay and gives his 11 percent rise to charity. Turkeys are gentle creatures known for their resourcefulness and agility, Benjamin Franklin called the Turkey “a bird of courage” he thought the Turkey truly deserved to be the national bird of the USA instead of the Bald Engle. Christmas may be an enjoyable time for millions worldwide but for many animals Christmas is the cause of appalling cruelty. In the USA around 20 million turkeys are slaughtered at Christmas time, here in the UK about a third of the 20 million turkeys killed each year are slaughtered for Christmas dinner. In the USA a further 45 million are massacred to celebrate Thanksgiving. A turkey is not here to provide a meal at Christmas, a turkey is a thinking feeling being with a life of his own. A turkey is not an automaton driven by instinct, but like all animals he is a conscious being aware of and able to interact with his surroundings: sentient. 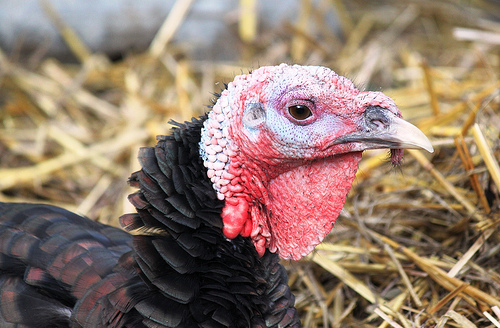 Did you know turkeys enjoy listening to music and will sing along with it, they enjoy having their feathers stroked and like all creatures they enjoy their freedom and wish to live. Turkeys can run up to 18 miles per hour. In the wild they can fly at speeds of 55 miles per hour. Yet while being reared for food they will spend their lives in dreadful conditions in factory farms cramped in filthy windowless sheds never seeing the light of day, never flying or running, not even walking – how can they with only 3.5 square inchs of space. Fed hormones in order that they grow as quickly as possible in the shortest space of time they become crippled by their own weight. After this misery of an existence they are killed at about 5 months old to celebrate the birth of a person whom many believe to be a man of peace. Though not as obvious as the ritualistic slaughter in various religions world-wide it is slaughter nonetheless to commemorate a religious festival. As factory-farmed turkeys rapidly grow, they run out of space to move and they are forced to wallow in their own excrement. http://www.peta.org/issues/animals-used-for-food/factory-farming/turkeys/#ixzz2nnojg6cT – Watch the video if you can. Again this video is hard to view, even listening to the audio turns my stomach because of the callous cruelty committed towards these defences creatures. The fact that we share this world with people who commit such heinous deeds of cruelty towards defenceless creatures is sickening. The thought that people we associate with every day in the course of our lives may go out each morning and perpetrate such inhumanity towards helpless animals is disturbing. The video shows deliberate cruelty. Factory farms and slaughter houses attract the perverted and sick members of our society who derive pleasure from harming a defenceless animal. While animal welfare regulations may be in place in some countries such as here in the UK does not mean that Turkeys do not suffer. Another harrowing film , just so heart breaking. Wicked cruel people not fit to be called human treating these beautiful sensitive creatures like so much garbage. Thousands of turkeys destined for dinner tables across the UK have been discovered in “appalling” conditions during a recent undercover investigation. Many birds filmed by vegetarian campaigning group Viva! had leg deformities and injuries, with some birds demonstrating difficulty walking. A Viva! 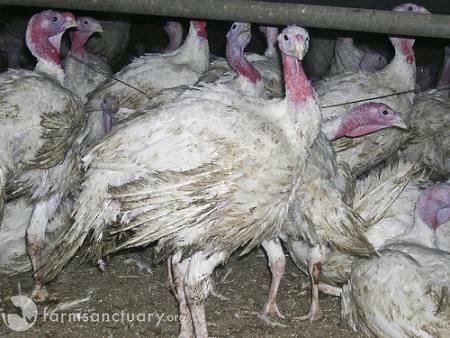 Campaigner describes her experience visiting turkey farms in Norfolk. Late one night in November 2002, I drove to Norfolk with Louise Port of GMTV, who was joining our investigation into Christmas turkeys. The quiet country roads around Bernard Matthews’ complex at Weston Longville, were deserted. We parked and made our way through a thicket of trees to a long, windlowless barn that stretched away into the darkness. I could only see the one but was aware that this huge site contains somewhere between 40 and 80 sheds. A very succinct and accurate description of the atrocities of factory farming as it relates to turkeys and all that takes place within the first three hours of their tormented lives! The easiest action and most immediate is to stop eating turkeys for Christmas or the flesh of any other living being: duck, geese, chickens, swans, even deer are all killed for Christmas. Send for Animal Aids FREE Christmas Without Cruelty pack http://www.animalaid.org.uk/h/n/ACTIVE/action/ALL/1133// – Please send for this even though it may be a little late this year you will be well prepared for every other Christmas to come. Order a free Vegetarian/Vegan Starter Kit. For people living in Germany, UK, Canada, India, Ireland and USA http://action.peta.org.uk/ea-action/action?ea.client.id=5&ea.campaign.id=23376 – Scroll to the bottom of the page for our international Peta websites where similar forms may be found. Watch the PETA Cartoon and sigh up for Christmas recipes PETA cartoon Video – though it is a cartoon this is nonetheless disturbing: http://action.peta.org.uk/ea-action/action?ea.client.id=5&ea.campaign.id=24340 -Scroll down to sign up for holiday/Christmas recipes.Get into the Christmas spirit by making sure that no animals are harmed for your food. Sign up to receive recipes and tips for enjoying delicious, guilt-free foods during the holidays and beyond. http://veganeasy.org/ – Sign up to the Vegan Easy Challenge and make the move towards compassionate, healthy and eco-friendly living! With every passing day it seems as though the atrocities perpetrated towards animals never ceases and becomes increasingly ever more shocking. There is more action you can take further down to end this inhumane treatment not only of sheep but cattle also. Please continue reading and watch the video if you have not already done so. The video has been released by Animals Australia and shows shocking footage of sheep being cruelly treated during the Eid festival in October. Animals Australia says the footage was taken in Jordan and highlights the contravention of new rules designed to protect Australian-reared animals from unnecessary cruelty. Transporting sheep is in itself an abuse as sheep suffer terribly during transportation. The Australian Government can stop this hideous cruelty to sheep by ceasing to transport them to countries like Jordon or anywhere else for that matter. Sheep are sentient beings, they are aware of what is happening to them, and without a doubt they suffer pain as you and I. Like us they feel fear and wish to live. This behaviour is not acceptable for a country that would consider itself to be ethically progressive. Australia is as guilty as Jordon in this matter. Every year, millions of Australian sheep are crammed onto multilevel, open-decked ships bound for ports in the Middle East and North Africa. When they arrive, they are dragged to shore as if they were sacks of coal, and their throats are cut while they are still conscious. PETA US and Animals Australia have recently released the results of a joint undercover investigation that exposed unspeakable cruelty in the live-export trade. 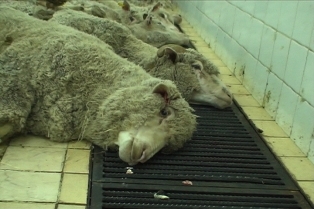 The horrors revealed in the investigation show the real-life experience of thousands upon thousands of sheep. No animal should ever suffer the hellish conditions of the live-export trade or the terror of cruel slaughter methods. Take action below by contacting Australian Prime Minister Tony Abbott and asking him to put an end to this horrific practice today. Please consider writing a postal letter which is often more effective. You can use the template as a guide. Click the link below to send an e-mail. Again please personalise if you can. Please do the best you can. This page includes more information including the full length footage of the above film if you can stomach the brutality of what is supposed to be a religious festival. Jordon is not alone in allowing such ill-treatment of animals, Israel also is responsible for the inhumane treatment of animals shipped to them by Australia. After reading the above I am appalled. Toney Abbott says live export “is a good industry”. It might be good for those who make a profit but for the unfortunate animals who suffer this hideous cruelty it is anything but. The people of Jordon who carry out such cruelty to any sentient creature might want to heed the words of the Prophet Muhammad. The ideal situation would be a vegan world where no one sends animals thousands of miles away to suffer horrific death at the hands of sadistic monsters who do not respect the creatures they believe their God created, and who show no compassion that their respective religions teach. Please do no feel complacent as here in the west we have our own brutal massacre – Turkeys at Christmas time. While there are laws to prevent unnecessary cruelty it does not mean that such brutality does not happen.An abattoir I can well imagine provides an outlet for those in our society who derive pleasures from harming animals. Gentleness and intelligence aside sheep are sentient beings, they feel pain and suffer as we do. Sheep like us are mammals they have a brain and a nervous system so of course they suffer. Please take all or some of the actions above help to stop sheep and cattle being sent to Jordon and elsewhere to suffer horrendous cruelty. Before you read anything else please make sure you sign the urgent petition http://england.shelter.org.uk/get_involved/wake_up_cameron?source=Homepage The same petition can be found on care2’s website http://www.thepetitionsite.com/takeaction/743/982/735/ International visitors may sign also. Would Cameron want his children to wake in a cold cheerless hostel Christmas morning? Of course not. Than why should any other child wake to Christmas in such deprivation? 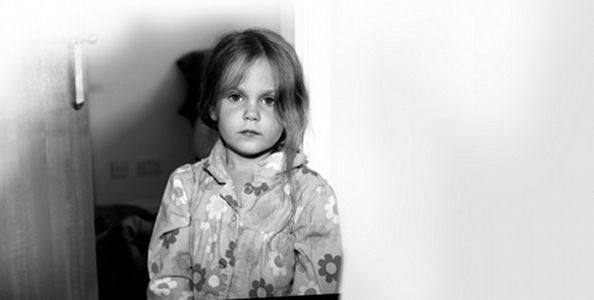 It is hard to believe that here in the UK 80,000 children will be homeless at Christmas time and of course after. While Cameron and others like him wake to Christmas morning in a warm centrally heated home to a luxury breakfast prepared for them while he and his over privileged family open expensive Christmas presents many less fortunate families will wake to Christmas in a cold depressing hostel. No Child should wake to such deprivation anywhere in the world let alone in the sixth richest nation. In a just and fair society no one should go without the essentials of food, shelter ,clothing and warmth, the fact children do so in the UK, in the sixth richest country in the world, is a disgrace. This situation has to stop. Cuts to welfare and the bedroom tax have plunged people into poverty. As have rising rents, soaring bills such as energy and food, and unemployment. While many live in luxury with wealth far in excess of need, including greedy self-serving MPs who have been granted a pay rise of 11 percent, more and more people in the UK sink further and further into poverty. Keep in mind that MPs’ present pay rise alone is far more than many people have to live on. While most people struggle on low wages, insignificant pay raises or no rises and even wage cuts and drastic cuts to benefits including sanctions these greedy MPs and the rich, whose wealth has in fact increased, have been insulated against the so called financial crisis that has devastated so many lives. Time to demand better from our government, time to demand they take action against poverty. The greatest problem is that for the most part it is the government who have plunged people into poverty and deprivation on a scale unimaginable as a result of austerity measures, including vicious welfare reforms. While charities do a marvellous job the onus is on the government to do something about poverty and homelessness, rather than adding to the situation the government should make the relief of poverty and homelessness a priority. Abolishing the bedroom tax would be a good start as will building affordable homes, more social housing and introducing a living wage and abolishing the present vicious welfare reforms that have added nothing but misery poverty and homelessness to lives already blighted by illness and disability. The sad thing is that many ill-informed people here in the UK have swallowed the poisonous rhetoric that has been spewed out by the government against benefit claimants willingly disseminated by most of the media. These ignorant bigoted people should keep in mind that the recently implemented horrendous welfare reforms affect children also, destroying young lives. No only should no one in the UK go without adequate shelter, food, warmth and clothing, but the fact that they while few speak out about this is a disgrace. “It’s so hard to give him a balanced diet as it’s impossible to make proper meals here, let alone a Christmas dinner. According the Save the Children: Britain remains one of the least fair countries in the developed world. Grow up in the UK today and your opportunities and chances in life can be largely determined by the time you’re seven – not because of your own ability or efforts but because of the economic circumstances you are born into. Nelson Mandela dedicated his life to equality, peace, and human rights, he has inspired many people to fight for a better world. People the world over have been in some way touched by Nelson Mandela’s courage and determination and his ability to forgive. He truly believed that we can have a just and fair society. We can best honour his dream by working towards a fair world for everyone, a world where no one dies of hunger and deprivation, were no one is oppressed and where everyone is equal. Long Walk to Freedom: Autobiography of Nelson Mandela. Nelson Mandela is deeply respected within South Africa, as of course he is the world over, in South Africa he is often referred to by his Xhosa clan name, Madiba, or as Tata (“Father”); he is often described as “the father of the nation”. “I have cherished the ideal of a democratic and free society in which all persons live together in harmony and with equal opportunities”. Listen to his inauguration speech, delivered on May 10, 1994, available in its entirety by clicking the link below. 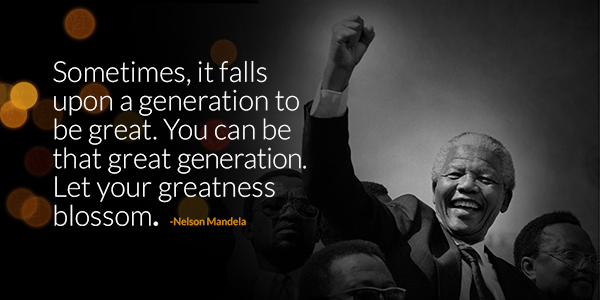 Be part of the generation that ends extreme poverty. Sharon Gelman’s a blog post about her memories of Nelson Mandela. This is just so shocking, is there no end to the atrocities inflicted on the other creatures with whom we share this world. I am horrified , as most decent people world-wide will be to learn about this the latest in the never ending abuse of animals. I hope that everyone who cares about animals will sign this petition and write to the African government officials concerned. 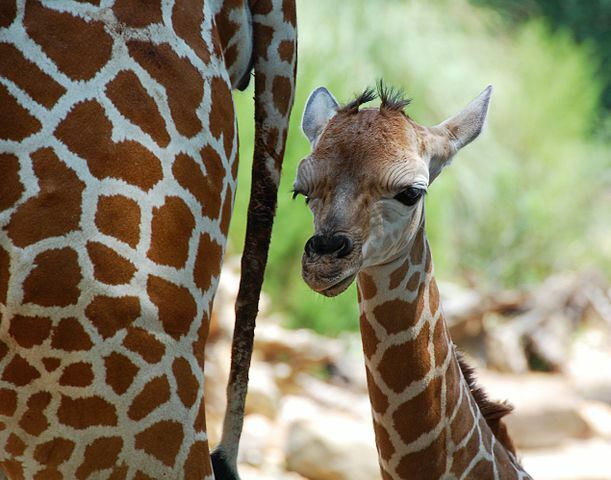 Giraffes must be protected from people who sadly have no sense of right and wrong, have no moral code and do not care for animals who have as much right to live as we do. What is wrong with people like this who derive pleasure from shooting such a gentle and beautiful creature or indeed any creature. There has to be something seriously wrong with their mentality. I wonder what a psychological assessment would reveal. The thought that people get some sick pleasure from this appalls me in the extreme. To add further to the shock factor is the photograph included with the petition which shows a little girl among the hunters proudly displaying their heinous deed. Sad that such corruption of a child’s ethical values is allowed encouraged and condoned. Our world is a sad place of increasing abuse meted out to defenceless animals. With a fee of $3,800 to go and shoot giraffes, once again it is all about money for which it seems people are willing to allow the most horrendous of deeds. I have just noticed in the background two older children. The whole things looks like some bizarrely sick family trip out. Shocking, just appalling there are just no words adequate to describe how awful, how disgusting and unethical this is on just of many levels. Cameron and an hundred strong delegation are in China with the intention of increasing trade links with this totalitarian regime responsible for grave violations of human rights. I might add that there is no country more willing to turn a blind eye to China’s human rights violations than the UK. Most people consider that human rights are more important than trade relations – 70 per cent in fact according to an ICM poll commissioned by the Charity Free Tibet. On Friday a representative of Free Tibet delivered 10,000 signatures to Downing Street which included those who signed a Free Tibet petition to Chinese President Xi Jinping as well as those who signed postcards calling on the Prime Minister to speak up for Tibet. This week Cameron is meeting President Xi Jinping not to support freedom for Tibet because Cameron does not give a dam about Tibet or the gross violations of human rights, the killings, the torture, the imprisonment, the genocide and destruction of an entire culture. Cameron values trade more than human rights and is willing to overlook the atrocities that occur in Tibet and indeed China for the sake of investment. As usual Cameron ignores the wishes of the public and does what he pleases again for the benefit of the few at the expense of the many. “George Osborne may not have stood up for human rights and Tibet during his recent visit, but it’s absolutely clear that the British public expect Mr Cameron to do better. He was willing to raise human rights in Sri Lanka just days ago and he needs to show that Britain’s principles are not dependent on the wealth of his host. It’s clear from this poll that only a handful of British people believe trade with China is more important than human rights in Tibet and that they expect Mr Cameron to act like a statesman, not a salesman. “The Chinese government thinks that a combination of money and threats can ensure the silence of UK politicians. Mr Cameron needs to respect the views of the British people and prove that wrong. Since the Chinese invaded Tibet in 1950 1 million Tibetans have died and more deaths are added to this toll daily, this is more than the atomic bombs that killed 200,000 in Hiroshima and Nagasaki or the 800,000 who died in the Rwandan genocide. Calling for independence is a crime in Tibet as is having a photograph of the Dalai Lama. The occupation of Tibet by the totalitarian Chinese government has resulted in the repression and the torture of more than the three million Tibetan people. “Kerry gets way more than she bargained for when she shows off her new bag. Today I received the following e-mail concerning the above video, please read and share this information. By so doing you are helping to make people more aware of the plight of the people of Tibet. “A few months ago we set out to create a short film which would show the world just what the reality of life is like in Tibet. Of course, all foreign media is banned from Tibet and it’s extremely difficult to obtain footage of how Chinese forces oppress the Tibetan people for doing simple things that you and I take for granted. So we made a one-minute video which imagined what our lives would be like if we had to live under the same brutality. And it’s a hit! Nearly 14,000 views in just 10 days. If you are not certain about what is happening in Tibet Watch this powerful and very disturbing documentary. I found it difficult to watch in the extreme but please watch if you can. The people of Tibet need your support. Tibet Situation : Critical – Full Documentary by Jason Lansdell, is an extensive look at the current situation in Tibet and for Tibetans in exile. It covers the history of Tibet, before and after the Chinese invasion. The clips in this film are from a wide range of documentaries and news organisations, as well as never before seen footage. The main focus and theme of Tibet Situation : Critical is to show the brutality of the Chinese Government against the Tibetan people, as well as an end segment explaining how you can help. . .
How can people treat others so cruelly? How can the British government stand by and allow such atrocities to happen in the name of self interest and the insatiable greed of the few? The world can no longer stand by and watch such abuse of human rights and do nothing while millions suffer. Though the UK Claims to urge China to adhere to human rights the UK does not support Tibetan independence. The Tibetan people are so desperate that they take drastic action such as self immolation, yet the world does not listen and most certainly the Chinese will not. We need to increase awareness of the plight of Tibetans under the tyranny of the Chinese government. I emphasise the Chinese government as it is important to make the distinction: China controls news of what happens in Tibet few Chinese people know the true situation in Tibet. Call on world governments to take action and to speak up for Tibet. Watch and share Free Tibet videos of US President Barack Obama and UK Prime Minister David Cameron (not) speaking up for Tibet. Cameron has turned his back once again on decency and morality. He has betrayed what was once good about the UK in the name of the insatiable greed of the few, for the sake of trade which benefits only a tiny minority he has abandoned the Tibetan people to continuing oppression under a totalitarian regime not much better than that which existed in Germany and which resulted in genocide. This sociopath has once again ignored the wishes of the British people. Frankly I am shocked that under the leadership of this vile unelected dictator we are about to kowtow to a cruel and repressive regime responsible for genocide, the violation of human rights, torture and imprisonment of millions of people. Today I am ashamed to be British.